Lucifer continues to deal with Maze’ self destructive behaviour as Lucifer becomes more jealous of Chloe’s relationship with Cain. I always enjoy an episode that gives Maze the focus. The reason for that is that she is such an unpredictable character that the end result is always entertaining. More often than not her actions have meaning and the way she processes her emotions is so wonderfully unorthodox that her episodes end up being thought provoking in unexpected ways. Last week saw her move out of Chloe’s apartment after Dan called her out on her behaviour because it was having a negative impact on Trixie. He was right to do so because failing to consider the impact on others is one of her major flaws. For the most part she just acts without considering the consequences though there was a genuine effort on her part to be a better person when she considered her life more stable than it is now. Her friendship with Chloe was positive as well as allowing her to create a positive connection with Trixie, she made a meaningful connection with Linda who she trusted, Amenadiel was someone she tolerated having around and, most importantly, she felt that she had moved out of Lucifer’s shadow. That last one was key because she was literally brought into existence to serve him so forging any kind of identity outside of that was a big step. Lately everything has been unravelling for her. Whether you believe that her forbidding the Linda/Amenadiel relationship is immaterial for the purposes of this argument as the thought process behind it is the key consideration. For the first time in her long life Maze asked for something that she wanted after having her existence defined by doing things for others there was one thing that she wanted for herself and the response she got was for her best friend to sneak around behind her back and lie to her. It’s possible that Linda could have convinced Maze to give her blessing for Linda’s relationship with Amenadiel though we will never know because she chose to be dishonest. The dishonesty is what has upset Maze so much and caused this self destructive streak. As of this episode she decides that she’s had enough of the heartache that being on Earth brings her so asks Lucifer to take her back to Hell. After everything she has been through she has a burning desire to return to what she knows and essentially give up. It’s a valid position to take because pretty much everyone can relate to wanting to run away from life at one time or another. Lucifer refuses because his last trip to Hell began the whole Abel fiasco. He uses the fact that Chloe was almost killed as the justification for his refusal which pushes Maze to further spiral out of control. In true Lucifer tradition the case of the week relates to the central conflict in some way. In this outing Maze is framed for murder on the very week that there is genuine doubt as to whether she did it or not. Having her show up on security camera footage is fairly damning first off and having her produce the murder weapon as well as confess to everything would seem to close the case. Fortunately for Maze she has better friends than that and there is a general assumption that she isn’t responsible for the murder and a strong focus on proving her innocence. Maze may not be prepared to admit it but she has made an impression on a number of people and the commitment to making sure she doesn’t go to jail for the -what they think is the- rest of her life should prove that to her. Of course she is too angry and hurt to see that and goes about proving her innocence alone. She does so by getting herself arrested and running her own investigation. As always Lucifer makes this all about him and assumes that Maze has killed someone in order to manipulate him into sending her back to Hell. In a sense he knows her better than anyone else does because of how long they’ve spent together though he is largely ignorant of her growth since removing herself from his shadow. He doesn’t see this side of her because he refuses to see it and it has to be said that Lucifer is a pretty terrible person in this episode because of the way he treats Maze. For the longest time he is determined to prove that she’s the murderer and sees it as a cry for attention to for him to take action which couldn’t be more arrogant or wrong. The only person who agrees with him is Dan but he’s amusingly shot down by everyone else when he suggests it as a possibility. The worst part is that Lucifer persists in trying to prove Maze is guilty to the point that he feeds information to people being questioned so that they can successfully give a vague description of what Maze looks like. Lucifer does see the error of his ways to a degree when he has no choice but to admit that Maze is most likely innocent and appears to have a genuine moment with her towards the end of the episode but even that is selfish. He points out that he doesn’t want to lose her but adds the “not you too” qualifier proving Maze’s point to him about nobody ever putting her first. Once again she’s upset because she seems to be an afterthought in the lives of others even though Linda opened up to her about their friendship being more important than her relationship with Amenadiel. Maze sees that particular point as only being true after Maze had exposed her lies and made her feel guilty about them. Similarly Lucifer’s statement proves to her that he only comes to her when whatever obsession he has falls through be that Chloe, Cain or whoever else he decides to play favourites with at that moment. 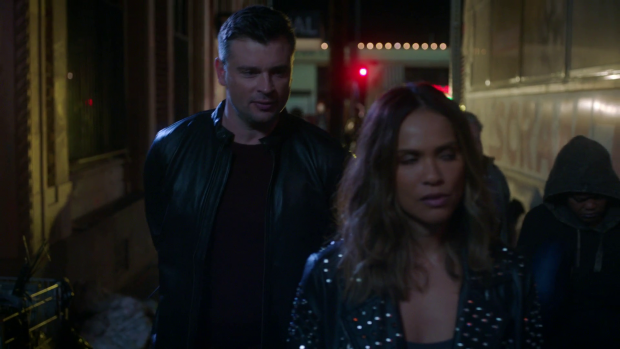 Lucifer is the sort of person who fails to consider how his actions will impact others and Maze is definitely tired of that treatment. Of course Maze is far from perfect as she still fails to accept responsibility for anything that she does. I’ve already mentioned that she fails to notice how much support she actually has in her life but she also demonstrates a lack of humility when it comes to admitting her mistakes. Pointing it out prompts an aggressive reaction from her so a lack of self awareness is one of her biggest problems. There is a moment where it appears that Chloe is about to get through to her. She tells Maze that she really wants her to open up and doesn’t understand why she won’t. It’s an impassioned plea from one friend who is eager to help another. Lauren German completely nails this piece of dialogue where Chloe lists all of the positive things Maze has done for both her and Trixie while excusing some of her mistakes because she acknowledges and accepts that nobody is perfect and that having her around is better than not having her around. Once again expectations are subverted when Maze doesn’t crumble at this declaration of affection even if she does stop herself from killing and decides that she has to leave to start fresh. This is the point that Cain comes in offering to work with Maze to achieve their mutual interests. In this case their mutual interest seems to be getting rid of Lucifer in some way. Cain makes that intention clear earlier in the episode when he realises that Lucifer will always be in the way of his relationship with Chloe thanks to a handy cat analogy so sees Maze as an opportunity to turn something of his own against him. This further shows Cain’s ability to manipulate people perfected over a very long life. Chloe’s relationship with Cain is confusingly handled in this episode. The fact that it exists is fine because it was established last week but the execution of it left a lot to be desired. Chloe acts out of character when around him in terms of how she tries to keep it a secret from others and the really obvious way she goes about that. 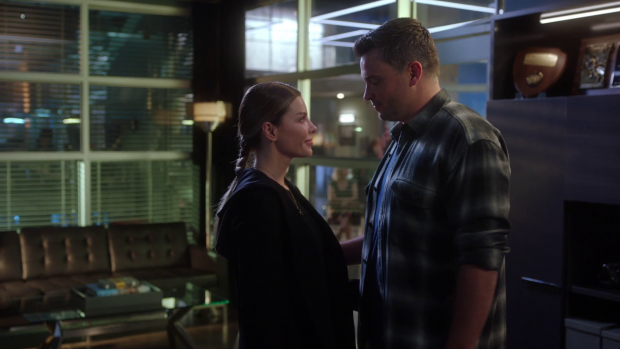 Tom Welling and Lauren German have great chemistry together and the fact that their relationship is essentially a lie to help Cain achieve his goal of dying adds drama to it because Chloe is oblivious to being manipulated. It’s really jarring to see that Cain has perfected the art of deception to the degree that he seems entirely genuine in creating a relationship with Chloe. 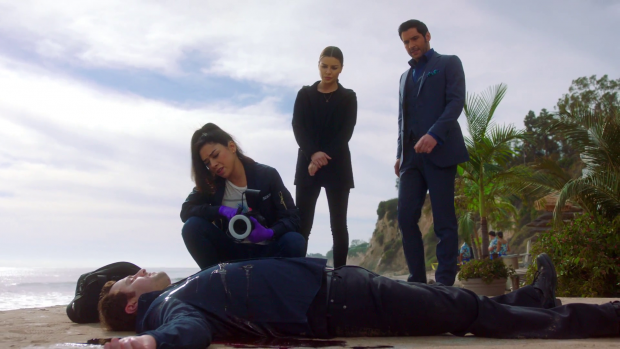 Lucifer’s possessive nature still lurks around the fringes of this connection further failing to endear him in this particular episode. Charlotte’s thirst for the truth continues from last week with the debate over whether to be honest with her. Amenadiel decides that she deserves to know which annoys Linda as she wonders why he asked for advice in the first place. I see two things wrong with this; the first is that she fails to understand that the person asking advice has no obligation to take that advice and the second is a failure to understand that her situation is entirely different. Charlotte is losing her mind wondering what happened during her memory gap where Linda was in a place of mental stability so the only way for Charlotte to achieve closure might be learning the truth. It isn’t Linda’s finest moment and definitely feels out of character for her, almost as if the writers needed her to oppose this to pad out the plot without considering if it made sense for her to argue against telling Charlotte the truth especially when she is tasked with helping Charlotte on the road to mental health and she fails to consider how terrified Charlotte is of being crazy. Lucifer goes about telling her in completely the wrong way by giving her a quick fire summary of everything that happened before sending her to Amenadiel if she has any follow up questions. This is a textbook lack of sensitivity as he doesn’t consider the weight of the information that he’s casually imparting. Charlotte also has no reason to believe it as she has no evidence that Lucifer or Amenadiel aren’t crazy though she actually sees the information as being weirdly plausible which could be a lingering familiarity from her time being possessed. Tricia Helfer plays the reaction to finding out the whole truth brilliantly. Her tears of joy at finding out that her sanity is more or less intact is really powerful in the way it comes across. Lingering on the image of the wings before doing the same on Charlotte’s face helps sell the moment and Tricia Helfer does excellent work with facial expressions. The number of people not in on the truth about Lucifer is down to Chloe, Ella and Dan now but I feel that it won’t be long until that comes out especially with Cain’s plan soon to come to a head. Another excellent episode that focuses on Maze and her self destructive tendencies. The episode further gets to the root of how she feels as she turns her back on everyone in her life. Her failure to see how much support she has shows how far gone she is and the pain she feels is very well established. Lucifer on the other hand shows how little he values her because he refuses to help her, assumes that she is capable of murder and even demonstrates that he values others when apologising to her. Maze thinks that nobody puts her first until they’re prompted to do so and is definitely at her lowest point making her easy prey for Cain to manipulate. Cain’s relationship with Chloe is strangely handled mostly in Chloe’s behaviour as she seems a little out of character in the way she acts around him. There’s added drama to the situation thanks to the knowledge that Cain sees her as a means to an end and is only acting like he values the relationship. Charlotte’s thirst for truth is brilliantly handled even if Linda behaves out of character to deliver a counter argument. Tricia Helfer’s performance as Lucifer confirms the truth to her is very powerful and sets up an interesting road for Charlotte to go down following this reveal.